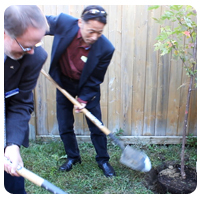 (September 25, 2013, Markham, ON – FOR IMMEDIATE RELEASE) To celebrate National Tree Day, this morning LEAF planted a native tree in the backyard of David Susilo, a Markham resident and participant of LEAF’s Backyard Tree Planting Program. Mr. Susilo and representatives from funding partners, the Regional Municipality of York, the City of Markham and Ontario Power Generation were in attendance to partake in the festivities and share their enthusiasm for the urban forest. LEAF’s subsidized Backyard Tree Planting Program includes a consultation with an arborist to help homeowners select the appropriate species and location. LEAF staff return to do the planting and provide homeowners with a tree care guide. LEAF also offers extended 5-year care packages that will help newly planted trees reach maturity. As part of its Greening Strategy, the Regional Municipality of York has a mandate to encourage and support stewardship and environmental enhancement on private land through tree planting. The Region is working cooperatively with LEAF to offer the Backyard Tree Planting Program throughout York Region. The City of Markham supports LEAF’s Backyard Tree Planting Program through their Trees For Tomorrow Fund. As part of The City of Markham’s commitment to planting a signiﬁcant number of trees, the Trees for Tomorrow campaign was conceived, and ofﬁcially launched in May 2008. The program surpassed its goal of planting over 75,000 trees by 2010, and continues to support tree planting initiatives in Markham. Ontario Power Generation is committed to protecting biodiversity and to reducing the impact of its operations on the environment. Ontario Power Generation supports LEAF’s Backyard Tree Planting Program as well as its educational programs including tree tours, public presentations and workshops. Healthy urban trees provide preventative health care benefits through shade, filtered air and cleaner waterways. When planted strategically, they also reduce energy costs, increase property value and offer privacy. Trees also provide food and shelter for birds, butterflies and other wildlife, supporting our urban ecosystems. Visit www.yourleaf.org for more information.